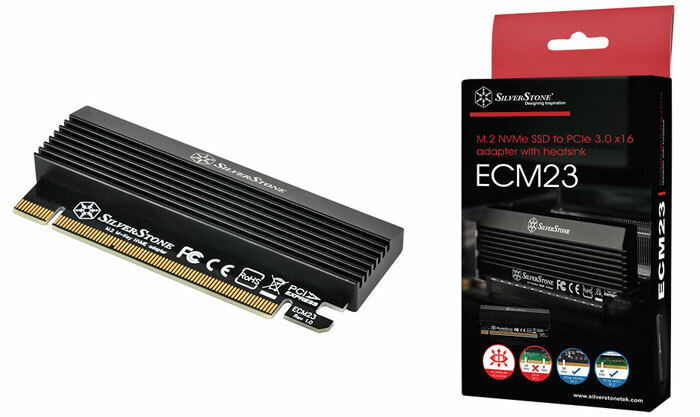 SilverStone has quietly launched its new ECM23 expansion card. The diminutive component allows the user to connect a single speedy M.2 device to via a spare PCIe x4 slot in your motherboard. The greatest attraction for the SilverStone ECM23 might be felt by users of older yet capable PC systems, where the motherboard has no M.2 slots to take advantage of next gen storage devices, for example. M.2 SSDs are more and more prevalent in retail and with the PCIe interface can provide a significant storage performance boost. At half Terabyte capacities you will have to pay about double that of a SATA SSD drive but some will find the system speed and responsiveness benefits worthwhile at this premium. Back to the product in question, and SilverStone says that its adapter card supports 2230, 2242, 2260 and 2280 length M.2 SSDs (the first pair of the four numbers signifies the M.2 card width of 22mm, and the second pair of number its length in mm). 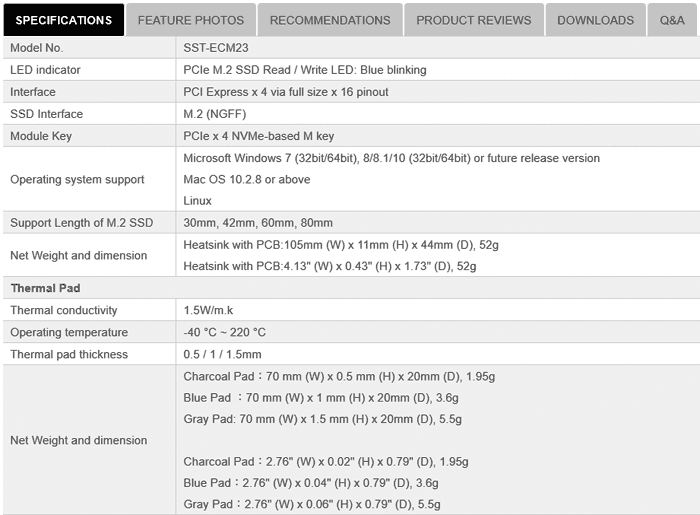 Importantly, SilverStone assures that there is no driver installation required to use its ECM23 adaptor but motherboard BIOS support is required if you wish to boot from the M.2 SSD (and it works with Windows, Mac or Linux). Another proviso is that M.2 PCIe-NVMe mode SSD requires the use of Intel 9 series (Z97 H97 Z170 X99) or higher version chipset with Windows 8 or newer. When choosing an M.2 SSD to pair with this adapter, SilverStone points out that the slower SATA (B key) type are incompatible. However, owners can choose between PCI Express using AHCI (M key) and PCI Express using NVMe (M key). It has already tested and verified the following Samsung drives; Samsung NVMe SSD SM951/961 M.2, Samsung NVMe SSD 960 EVO M.2, and the Samsung NVMe SSD 960 PRO M.2. Last but not least, SilverStone has taken steps to make sure your new PCIe SSD won't overheat when put under duress. A thermal pad and heatsink are included as part of the product. Pricing and availability have yet to be revealed.